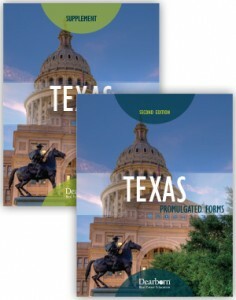 Texas Promulgated Forms provides a clear, practical approach to purchase agreements and an in-depth analysis of Texas Real Estate Commission (TREC) forms for new licensees and seasoned practitioners. Case studies provide students with hours of practice using TREC promulgated forms. Instructor Resources include outlines, exams, and a PowerPoint presentation. New for this edition is the forms supplement, which is a separate book that includes all forms for instruction as well as blank and filled-out forms for case studies.